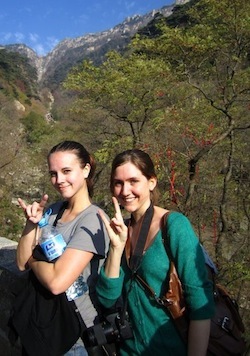 Misty Sirine (right) in China. Hello teachers and fellow world language students! My name is Samantha Ashworth, and I am a senior University of South Florida student currently studying abroad in Tianjin, China. Having completed my first semester here at Nankai University a couple of months ago, I felt the need to share some of my experiences here with my teachers and peers back at the home institution. Before coming to Tianjin for this year-long study abroad program, I had both completed four semesters of Chinese classes at USF, and was fortunate enough to participate in the two consecutive summer study abroad programs (Chinese Learning in the Culture Tier I and Tier II) currently offered by USF Study Abroad. This combination of study opportunities, particularly the two intensive summer programs in Qingdao, has proved to be absolutely invaluable in preparing me for a continuous year abroad in China. Without the language skills and cultural knowledge I was able to gain from these rigorous programs, I would without a doubt be having a very different experience here in Tianjin. I strongly believe the foundation I received before coming here has enabled me to take this particular learning opportunity to a whole other level. I look forward to each new challenge that can (and will) present itself, and with each day that passes, I see myself coming closer and closer to an advanced level of Chinese. Since arriving here at Nankai University, I have found myself at a level of cultural understanding that I didn’t think was possible. I feel like my language abilities have absolutely skyrocketed, but at the same time I have also become aware of how very much there is to learn; this several thousand year-old cultural rabbit hole is much deeper than I could have ever imagined. I have also come to accept that I may very well never fully understand some aspects of this complex, multidimensional culture. But when it comes right down to it, it is the existence of this would-be insurmountable challenge that keeps me so fascinated, and provides me with an unyielding motivation to push myself further, and learn all I can while I’m here. It is truly an incredible learning opportunity, and there is nowhere I would rather be right now than here taking full advantage of it. Another defining advantage of spending the last seven months here in Tianjin is the completely new perspective I now have on almost every aspect of life. I feel like I am viewing and experiencing the world in a totally different way than I was living and going to school in America. Cultural and standard of living differences I never gave much thought to before have become undeniable, and current events seem almost tangible. I now have access to the observations and opinions of not only the local Chinese, but the entire international community I am now a part of here. None of us studying here in Tianjin would be where we are today if it weren’t for the enthusiasm and unyielding perseverance of USF’s talented World Languages faculty. I think for most students, the instructors can really make or break the experience of learning any new subject; particularly a difficult foreign language. Thank you all for your endless support and encouragement, and keep inspiring students! We are lucky to have you.